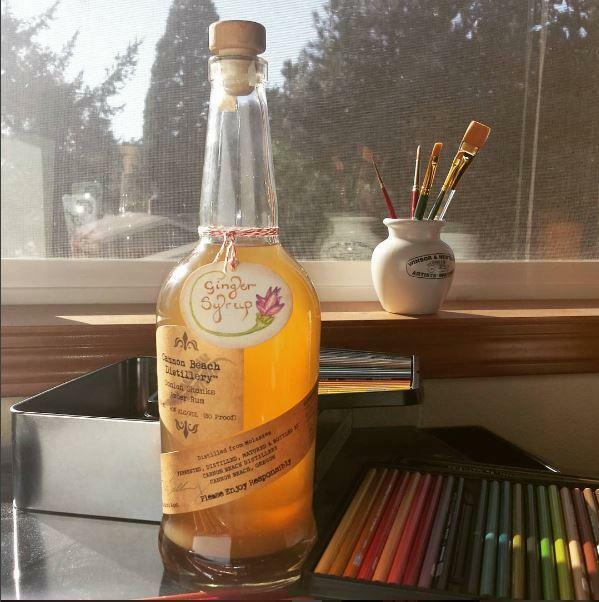 Spice up your beverages and desserts with Homemade Ginger Syrup! Mr. B and I love ginger. When we discovered how easy it is to make homemade ginger syrup, and this delicious condiment immediately became a new favorite among our kitchen staples. 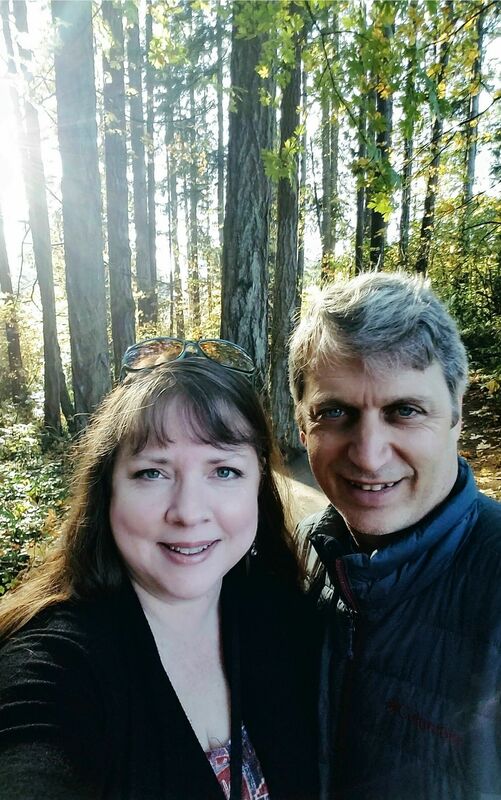 Scroll to the bottom of the post for just a few of the ways we enjoy using it. Please let me know in the comments if you come up with any new ideas! Put 3 cups of water and all the sliced ginger in a blender and blend until ginger is chunky smooth. Pour the blended mixture into a large saucepan. Stir in the remaining 3 cups of water and the sugar, and bring to a boil over medium heat. Reduce to low and simmer for 30 minutes. Allow the syrup to cool in the pan. 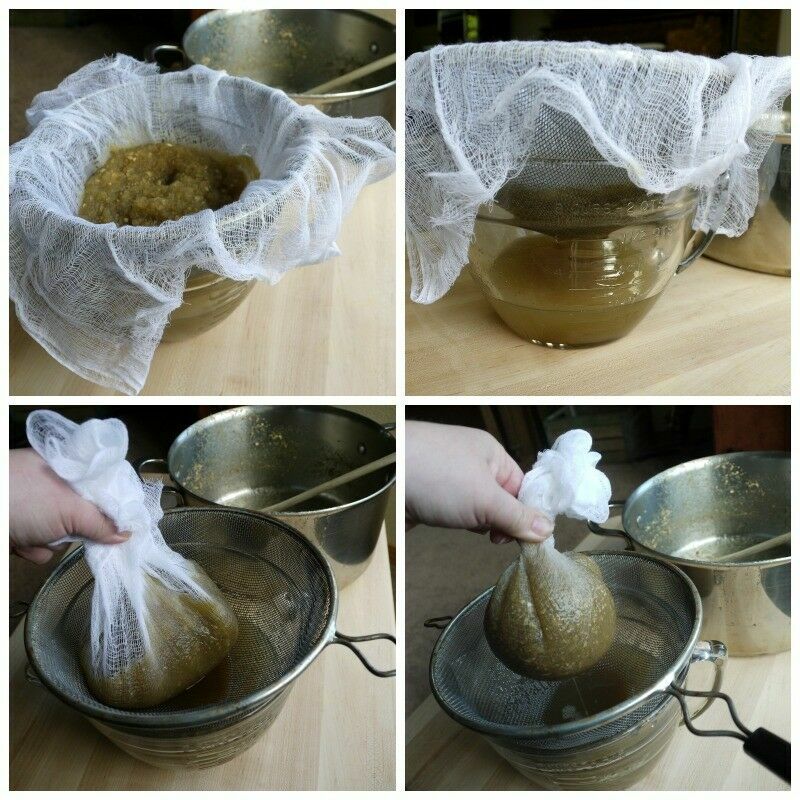 Line a sieve with two to three layers of cheesecloth and strain syrup. Squeeze the cheesecloth bag tightly to get out all the gingery goodness. Pour syrup into containers and refrigerate or freeze. Makes about 8 cups of very strong ginger syrup. You can easily scale down the amounts (3 cups/3 cups/1/2 lb) and make less syrup, but you will regret it. This stuff is delicious! 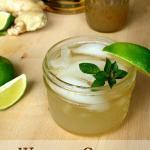 Ginger ale – add a tablespoon of Ginger syrup to a glass of club soda or seltzer water and make your own ginger ale. Ginger Ice Cream – just drizzle a couple of tablespoons into the ice cream mix before you freeze it. 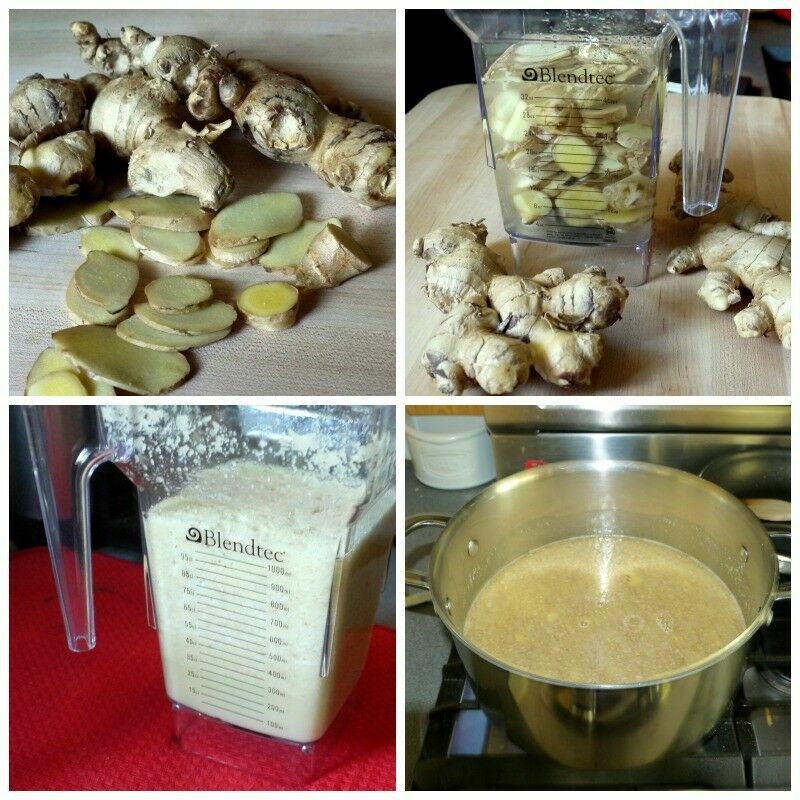 Ginger Yogurt – add a teaspoon or two to a cup of yogurt. Vanilla, peach, and raspberry all taste great this way! Disclosure: This ↑ ad bar contains affiliate links, which means we may receive a commission if you click a link and purchase something that we have recommended. While clicking these links won’t cost you any extra money, they will help us keep this site up and running – and (relatively) ad-free! Please check out our disclosure policy for more details. Thank you for your support! This is exactly what I need right now! Thank you! I’m going to try to make some this weekend! Renee, I love this! 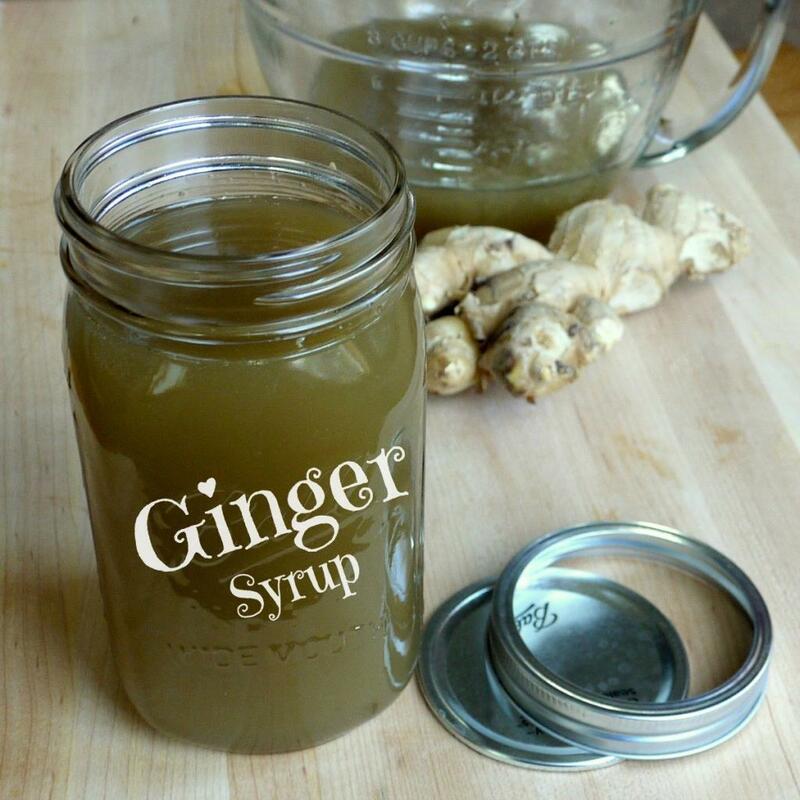 I, too, am a huge fan of ginger and use it in so many dishes and smoothies, but never thought to make my own ginger syrup. Adding this to my “gotta make” list! I wanted to make something like for my birthday last year. I ended up only making a pomegranate syrup. It was really yummy. I will have to try both this year. Oh, I’m definitely going to do this. My husband LOVES ginger and would go wild for this treat! Looks amazing! I’m going to try making a batch this weekend! I find little bite of ginger syrup goes a long way. Has a great taste and so useful. I’ve never been the biggest fan of ginger, however, I think this would be great to make for our homemade moscow mules! It’s great for mules. You can balance the ginger to your tastes instead of relying on finding the right ginger beer. Always good to come across new recipe ideas and blending the ginger before cooking it is certainly a first and something I will try. The sugar content is a little high for my tastes though as an alternative, a 2:1 ratio of water to honey is just as effective, gives it a naturally sweet flavour and improves the consistancy of the syrup.